This article is about the mountain in Catalonia. For other uses, see Montserrat (disambiguation). Montserrat (Catalan pronunciation: [munsəˈrat]) is a multi-peaked rocky range located near the city of Barcelona, in Catalonia, Spain. It is part of the Catalan Pre-Coastal Range. The main peaks are Sant Jeroni (1,236 m), Montgrós (1,120 m) and Miranda de les Agulles (903 m). It is well known as the site of the Benedictine abbey, Santa Maria de Montserrat, which hosts the Virgin of Montserrat sanctuary and which is identified by some  with the location of the Holy Grail in Arthurian myth. "Montserrat" literally means "saw (serrated, like the common handsaw) mountain" in Catalan. 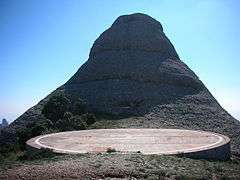 It describes its peculiar aspect with multitude of rock formations which are visible from a great distance. The mountain is composed of strikingly pink conglomerate, a form of sedimentary rock. Montserrat is Spain's first National Park. In 1493, Christopher Columbus named the Caribbean island of Montserrat Santa Maria de Montserrate, after the Virgin of Montserrat. The Benedictine Abbey can be reached by road, by the Aeri de Montserrat cable car, or by the Montserrat Rack Railway. The lower stations of both the rack railway and the cable car can be reached by Ferrocarrils de la Generalitat de Catalunya train from Barcelona's Plaça d'Espanya station. From the abbey, the Funicular de Sant Joan funicular railway goes up to the top of the mountain, where there are various abandoned hovels in the cliff faces that were previously the abodes of reclusive monks, while the Funicular de la Santa Cova descends to a shrine. The highest summit of Montserrat is called Sant Jeroni (Saint Jerome) and stands at 1,236 meters (4,055 feet) above sea-level. 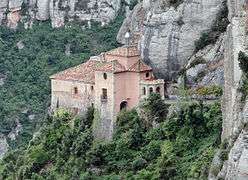 It is accessible by hiking trails which connect from the top entrance to the Sant Joan funicular, the monastery, or the base of the mountain. 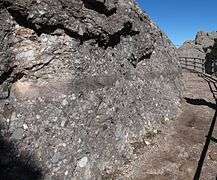 The Cavall Bernat 1,111 meters (3,645 feet) is an important rock feature popular with climbers. Panorama of the south-west view towards Collbató and El Bruc. ↑ Wolfram von Eschenbach, "Parzival", The legend stems from the Medieval German tale that refers to a mountain called Monsalvat as the location of the grail. Wikivoyage has a travel guide for Montserrat (Spain). Wikimedia Commons has media related to Montserrat.